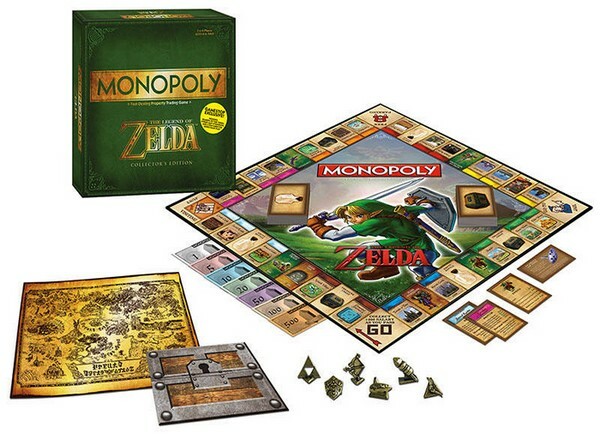 Monopoly Zelda, WoW & Co.
Gamestop will sell Legend of Zelda Monopoly version with exclusive content. The game which features Hyrule locations instead of the more familiar Monopoly properties, Monopoly money bearing pictures of rupees (in the wrong colours), Deku Sprouts and Deku Trees instead of houses and hotels, and Zelda-themed cards and game pieces — is being offered as a $39.99 preorder with a release date of 15 September (for uk/states). You can also find the World of Warcraft version, Pokemon X & Y and Assassin’s creed version. In France, the french subsidiary Micromania, will seel it before christmas 2014.